I recently met with Clare Carroll of Inc60 to record a podcast about the pre-startup and early stage business journey. 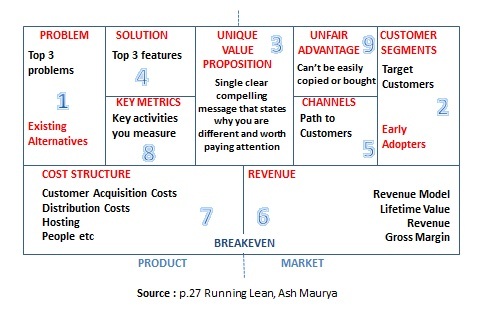 The Lean Canvas as outlined in the book Running Lean is an ideal tool at this stage. The 30-minute podcast also discusses Sales, Mentoring, building your Team and supports for business. Thanks to Maria Staunton for mentioning my name to Clare. Please refer to the official Blog article by Inc60 if you are interested in any references or resoures to include Books mentioned in the podcast. This post is to complement that article setting out some salient points that I could also have talked about. BTW, I use the Android Player FM Podcast App. Download from the App Store and subscribe for your choice of shows to include INC60. The app costs nothing to install and is free of ads. It works great with bluetooth in the Car. Startups don’t have all the answers. They can’t – they are searching for a business model. They need to be open to Learning. I listened to the Inc60 podcast with Kevin Kelly where he talks about his Xceptional Execution methodology. He talks about Learning as one of his four pillars in Xecution. There is two aspects to that. The first is going out talking to Customers and other market experts. The 2nd is formal training such as New Frontiers and Empower which bring mentoring, workshops and peer networking. There is a startup process and it is important to make a plan. Particularly for technology companies, Lean Startup has been embraced as a great way to get products to market that are more likely to be successful. Market Research was always critical and now seems much more accepted by startups – as in there is no point just coding a product before talking to the market. And that is what market research is. There is no need to get overwhelmed with it – just find ways to go out to talk to your Customers. I would be a big advocate of Mentoring. Great way to do your planning. The fact that you can actually talk to someone who knows what you are talking about is a great benefit. They can help you to figure out what you want to know and what you want to ask of Customers. And what you want to as about is outlined in the Lean Canvas. There are 9 building blocks. The first step is to fill in the assumptions as to what you think are the right answers. And then you go and validate those by talking to Customers. A big concept in Lean Startup is a Minimum Viable Product or MVP. So I am a big fan of market research but MR has its limitations. The big one is will people actually buy the product (in sufficient numbers and at the price that you need them to). The only way you will find out is if you move to market testing which is not dissimilar to an MVP. I read the Steve Jobs book and I think it was in there it said that the forecast Sales for the iPod surpassed all expectations. So even Apple could not have predicted that within 14 months that 600,000 iPods would have been sold. The starting price was $399 according to MacWorld. And this brings us to the UVP or Unique Value Proposition which combined with Customer and Problem is a big part of the Lean Canvas. What is it that will make your customer sit up and take notice of your product solution. If your UVP is good, you can sell any product. When I deliver training on Business Models I always refer to Game Golf and their UVP which is just so good. I listened to John McGuire on Inc60 and it is a super podcast from 2015. Which brings us to sales, Every startup promoter needs to be a Salesperson whether they want to or not. A big part of Sales is being organized. The business needs to have a Strategy and then when you move to implementation, you need to set Goals and priorities. I wrote a blogpost for New Frontiers on Milestones for Growth Oriented Businesses. It identifies 4 milestone areas being: Product, Marketing, Finance and Team. This is the foundation of a plan or a roadmap for your business. It is a critical ingredient when you are going looking for investment as it needs to be communicated in your business plan or pitch deck. So the final point is that you are always selling what you and your team can do. For this you need to be convinced of the merits of the business yourself and the only way to do that is to follow the Process. You need to think like an Entrepreneur! I hope you enjoyed both the Podcast (listen above) and this blogpost. Comments and social shares both welcomed and appreciated. Enjoyed this podcast very much and loved the easy approach and non corporate speak in telling it how it is! Having learnt about the Lean Canvas from Donncha in New Frontiers Letterkenny I am a big fan and use it now with all my clients. The podcast has an easy flow and goes through the process of what you need to do to set up a business. I agree totally with the importance of mentoring and feel everyone should do this on whatever level they are on. I would also add the importance of networking and supporting one another and believe – that you know more than you think you know! !